Nestled amidst lush greenery, La Villa Des Palmes offers tranquil and elegant accommodation with free WiFi access throughout the property. Surrounded by nature, it features free parking space on site and provides daily housekeeping service. Boasting a private pool, spacious villa comes equipped with air conditioning, a personal safe, ironing facilities, minibar, a flat-screen cable TV and sofa seating area. The en suite bathroom includes shower facility, towels and hairdryer. At La Villa Des Palmes, guests have access to the common lounge area and shared kitchen facilities. Fluently-conversed in French and English, the friendly host can assist with luggage storage and airport shuttle arrangements. 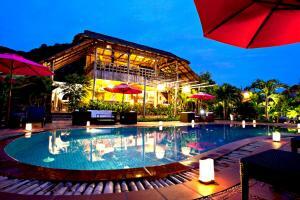 The property is approximately 72 km from Sihanoukville International Airport. When would you like to stay at La Villa Des Palmes ? Offering views of lush greenery, villa features a private infinity pool, king-sized four poster bed, sofa seating area and Cambodian silk curtains. Please inform La Villa Des Palmes in advance of your expected arrival time. You can use the Special Requests box when booking, or contact the property directly with the contact details provided in your confirmation. Please note that guests are required by the property to pay the full reservation amount via PayPal on the day of booking. La Villa Des Palmes will contact guests directly via email with payment instructions. Each day we'll check prices and send you an email for your selected dates at La Villa Des Palmes. If you don't have specific dates but would like to check prices for say next weekend or say next month we can check the price too. Click to write a review and share your experience of La Villa Des Palmes with other travellers.